Once upon a time when we were first married we lived in London. Once in 3 years I was organised enough to go to a craft/sewing/quilting exhibition at Earls Court/Olympia (somewhere like that – the detail escapes me!) and while we didn’t have much money I managed to find enough to buy some fat quarters of fabric. I don’t think I had a plan for them at the time, I just like them and they felt nice! Some of them were a soft brushed cotton. This is when I start to feel old again, I don’t really remember making this quilt, in fact I really have no idea how or when it happened. Looking back I think I had a bit of a thing about hands, Tobi had trained in massage and worked at the Walk-In Backrub (if you’re in London I can’t recommend a better way of relaxing, go on treat yourself) so hands really were his business (ok, elbows played an important part too!). 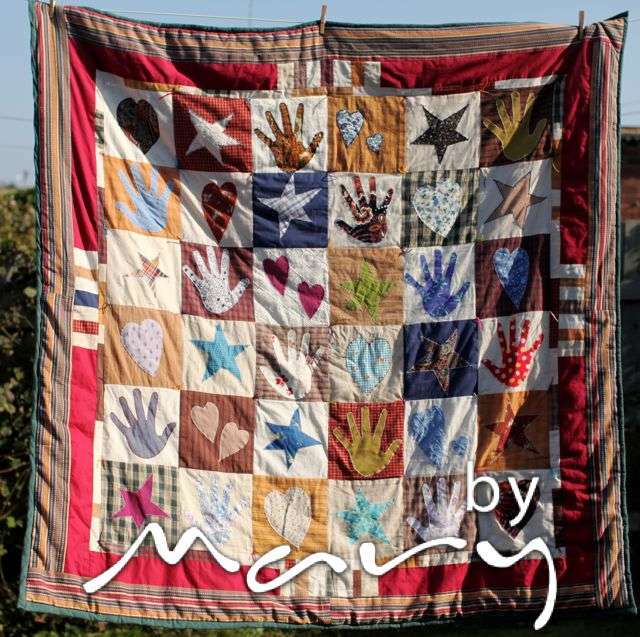 I came up with the idea of a quilt with hands appliqued on but thought that just hands might not be too interesting on their own so I went with some stars and hearts too. It was during that time that Habitat sold fabric by the metre and in their store on Tottenham Court Road they had a remnants basket that I would rummage through and come away with pieces that ‘might one day be useful’. I used a number of bits of remnants for the appliqué pieces. The fabric for the border of the quilt is a pair of cotton trousers from Dorothy Perkins c.1992 that I had kept (again they might be useful…). I didn’t machine quilt this one, but tied it with embroidery thread at the corner of each square. This seems to give it quite a soft feel, well I’m not sure if that is the reason but that’s my explanation, I’m thinking that as it isn’t ‘properly’ quilted then it’s looser and softer less structured. All in all it’s not really my style, not one of my favourites but it sometimes goes on Leahs’ bed and she’s never complained! 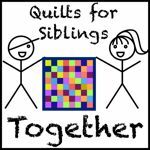 ‘Quilts – part 6’ should be here next week with a sad story to tell!